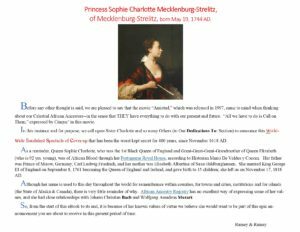 Princess Sophie Charlotte Mecklenburg-Strelitz, of Mecklenburg-Strelitz, born May 19, 1744 AD. Before any other thought said, we are pleased to say that the movie “Amistad,” which was released in 1997, came to mind when thinking about our Celestial African Ancestors–in the sense that THEY have everything to do with our present and future. “All we have to do is Call on Them,” expressed by Cinque’ in this movie. 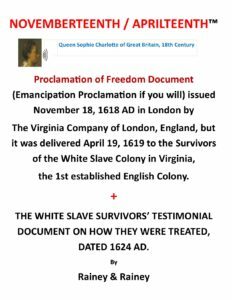 In this instance and for purpose, we call upon Sister Charlotte and so many Others (in Our ebook’s Dedications To: Section) to announce this world-wide fraudulent spectacle of cover-up that has been the worst kept secret for 400 years, since November 1618 AD. As a reminder, Queen Sophie Charlotte, who was the 1st Black Queen of England and Great-Great-Great-Grandmother of Queen Elizabeth (who is 92 yrs. young), was of African Blood through her Portuguese Royal House, according to Historian Mario De Valdes y Cocom. Her father was Prince of Mirow, Germany, Carl Ludwig Friedrich, and her mother was Elisabeth Albertine of Saxe-Hildburghausen. She married King George III of England on September 8, 1761 becoming the Queen of England and Ireland, and gave birth to 15 children; she left us on November 17, 1818 AD. Although her name is used to this day throughout the world for remembrance within counties, for towns and cities, institutions and for islands (the State of Alaska & Canada), there is very little reminder of why. African Ancestry Registry has an excellent way of expressing some of her values, and she had close relationships with Johann Christian Bach and Wolfgang Amadeus Mozart. So, from the start of this ebook to its end, it is because of her known values of virtue we believe she would want to be part of this epic announcement you are about to receive in this present period of time.